Does this old-timer really belong in the Hall of Fame? I regret that it took me so long to read John Thorn’s brilliant and seminal book, Baseball in the Garden of Eden: The Secret History of the Early Game. It’s brilliant, and seminal. The book’s been out for nearly four years now, and I count John among my friends. I should have read it immediately. I’m glad it took me so long. Let me explain. Alexander Cartwright, as you might know, is in Baseball’s Hall of Fame. According to his Cooperstown plaque, he was THE FATHER OF MODERN BASE BALL and a) set the bases 90 feet apart, b) established nine innings as the game length and nine players per side, and c) organized New York’s Knickerbocker club, which spread baseball to the Pacific Coast and even Hawai’i. So what may we reliably say that Cartwright did? In 1866, Charles A. Peverelly credited him thus in his book of American Pastimes: “In the spring of 1845 Mr. Alex J. Cartwright, who had become an enthusiast in the game, one day upon the field proposed a regular organization, promising to obtain several recruits. His proposal was acceded to, and Messrs. W. R. Wheaton, Cartwright, D. F. Curry, E. R. Dupignac Jr., and W. H. Tucker, formed themselves into a board of recruiting officers, and soon obtained names enough to make a respectable show.” Up to and including the Mills commission, this was the full reported extent of Cartwright’s ingenuity. The Hall of Fame is a deeply weird place. They do so much to preserve and promote the game’s history, and yet they still find room for a page like this, which is almost entirely devoid of any real history. There are worse things in life than a few undeserving people being in the Hall of Fame, especially with all the joy the living ones must have felt when they got that call and later stood on the Cooperstown dais. I’m certainly not in favor of kicking anyone out. It seems cruel. It also seems pointless. Wipe the slate clean on the Hall of Fame and there’d be a lousy honoree within 10-15 years. Yes, of course there are worse things in life. There are LOTS AND LOTS of worse things in life. There are worse things in life than someone spitting on the sidewalk. That doesn’t mean we should excuse spitting on the sidewalk. More to the point, how would it be cruel to kick Rube Marquard out of the Hall of Fame? He died almost 25 years ago. Whatever you might think of our postmortem fates, it seems highly unlikely that today ol’ Rube gives a damn about the Hall of Fame, one way or the other. His grandchildren? Okay, sure. But I really don’t think it’s our place to worry about an old ballplayer’s grandkids, who should be old enough by now to take something like this in stride. I certainly wouldn’t be averse to some procedure that reconsidered long-dead Hall of Famers. Or hell, at the very least, revising their plaques (and their Web pages) when they’re clearly in error. 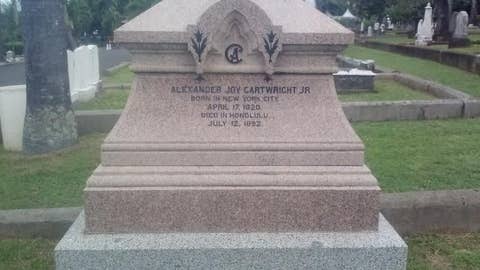 I’m glad I just got around to reading Baseball in the Garden of Eden, because just last week I was in Honolulu, where Alexander Cartwright is buried downtown. I took a photo of his burial monument, which you can see at the top of this page. What you can’t see are the baseballs that … I don’t know. Is "fans" the proper word here? Does Alexander Joy Cartwright have fans? Anyway, someone’s left baseballs at the foot of his monument. And a few feet away, there’s another monument that’s specifically about baseball; like the one in Cooperstown, it’s largely fictional.